So thanks to two projects, my son and I have found new ways to reuse these beautiful cards. 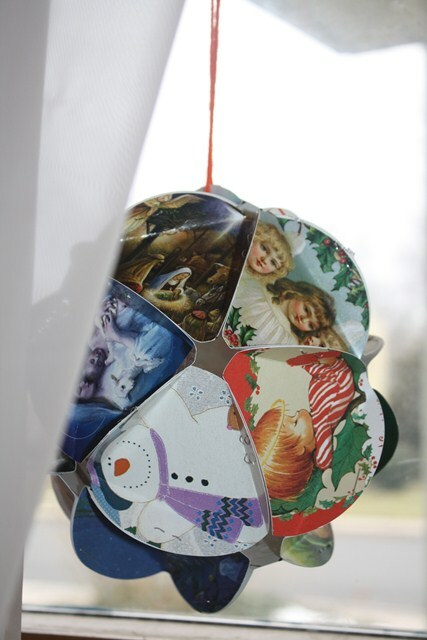 Last year in school, my son learned how to make a Christmas card ball, using principles of math and geometry–how cool! He has become slightly obsessed with creating these gorgeous decorations, so he made them as gifts for just about every family member between last year and this year, and he received plenty of hugs in appreciation. Aren’t handmade gifts a million times more valuable than store-bought ones? 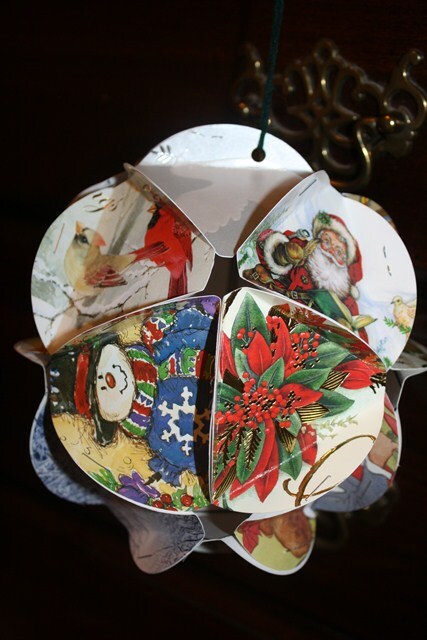 Each ball requires 20 circular images cut from Christmas cards, so you can imagine the number of cards he recycled! You can make a circular template, about two inches in diameter, or use scrapbook tools such as a circle cutter. 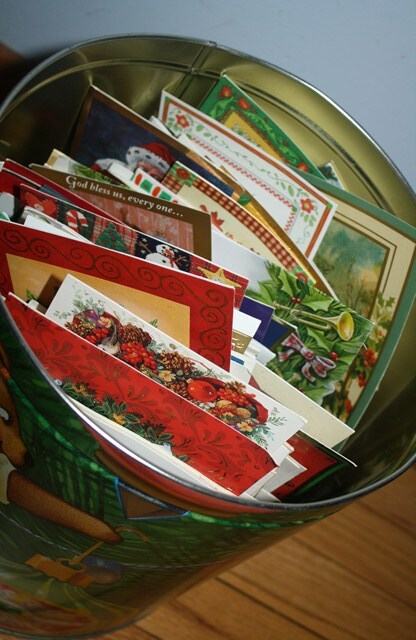 Sorting through the cards brought back many fond memories of family and friends as we admired illustrations, set aside personal photos for safekeeping, and read the messages and signatures. Between my son and I, we discovered new life for quite a few old Christmas cards. 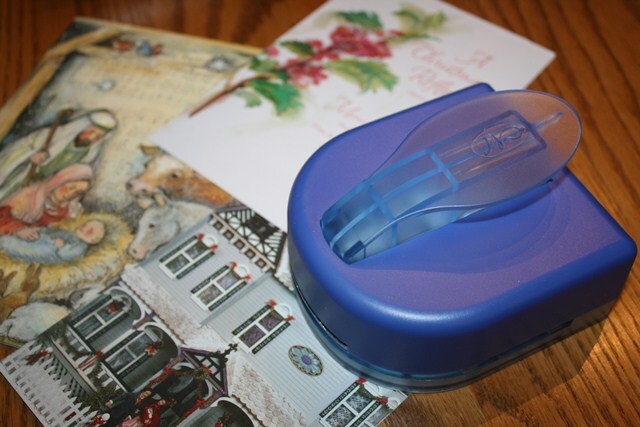 For information on the Creative Memories Tag Maker, click here. For a YouTube video explaining how to make Christmas card balls, click here. Please note: the video instruct you to use glue sticks but we used staples instead. I bet he must have made these with Mr. Floyd’s team! I have been recycling my cards through him for years. But now that I see how beautiful the balls are I may have to try a few myself! Yes, Sally, you are right and many thanks for donating cards. It’s a beautiful project! Karen, Keep meaning to tell you that I think the ornament idea is fantastic! I’ll have to start collecting traditional cards next year. Please repost this as Xmas 2013 approaches. 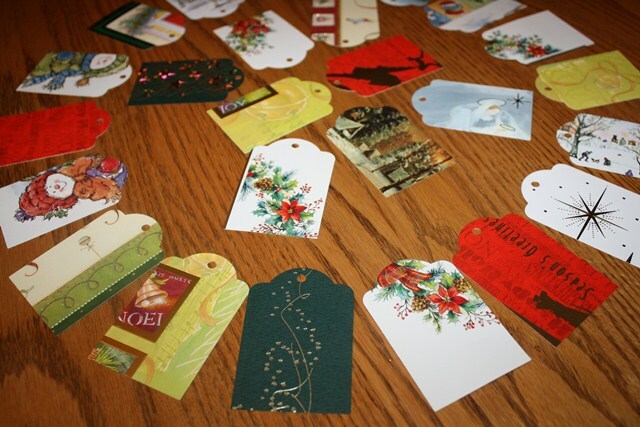 The gift tags are very clever, and I had not heard of the gadget that makes them; wonderful idea! Kat, I’m glad you discovered this post and reconnected with a childhood project! I think it’s a timeless, classic idea for young and young-at-heart, alike. Happy New Year!